We're beef eaters. No doubt about that -- vegetarians we are not. Mike is known throughout Savannah as Grill Daddy and his legend looms large within our family! When we were presented with the opportunity to review the world-famous Omaha Steaks -- we were just over-joyed! I can't begin to tell you how excited we were at the chance to try their amazing products. When the package arrived, it was all I could do to wait for Mike to get home and open it with me! When he walked in the door and saw the shipping lable, his eyes lit up and the biggest smile covered his face! The items come so well packed in a large styrofoam cooler with ice packs to keep the foods frozen. Nothing was thawed at all and everything was in absolutely perfect condition. Give the gift of taste and distinction with The Ideal Gift Collection from Omaha Steaks. 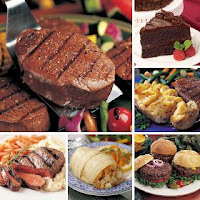 This gourmet collection includes our legendary Filet Mignons and Top Sirloins, juicy Omaha Steaks Burgers, premium Stuffed Sole, delicious Stuffed Baked Potatoes and decadent Chocolate Lover's Cake. It's a gift that is sure to be remembered throughout the year. 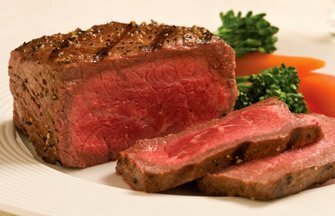 The Omaha Steaks Filet Mignon... our most popular cut of steak! Our Filet Mignons come from the heart of the beef tenderloin. This elegant cut is guaranteed to impress with its exceptional taste and texture. We start with premium, grain-fed beef that is naturally aged to give our filet mignon steak that distinct flavor, tenderness and quality you've come to expect. Omaha Steaks Top Sirloin Steaks... a grilling sensation! Carved from the center of the sirloin, our Sirloin Steaks are naturally lean and bursting with bold, beefy flavor. And because of the way our master steakcutters craft these steaks, they're more tender than ever before! Boasted as one of the most flavorful steaks, our Top Sirloin Steaks are great for grilling. Our rich and seductive Chocolate Lover's Cake draws rave reviews from even the most seasoned chocoholics! 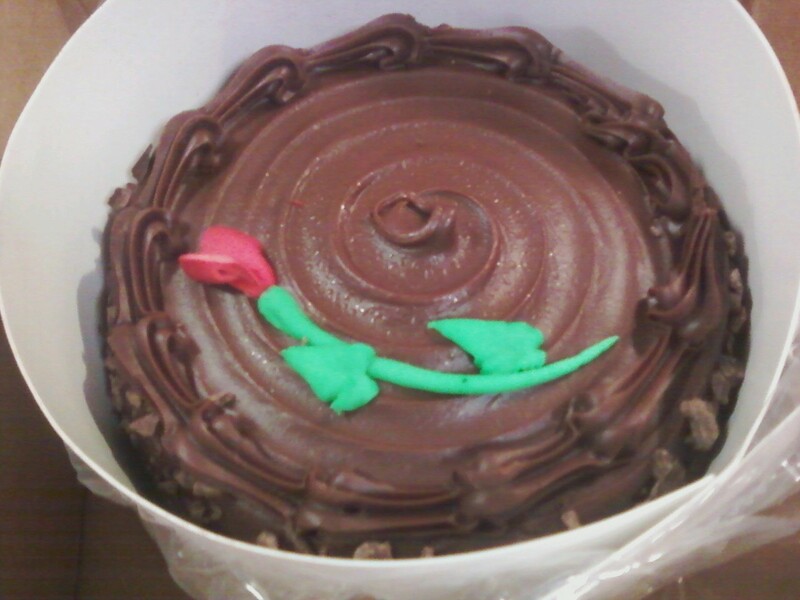 A red rose adorns the top of the cake and chocolate shavings decorate the sides. Moist, indulgent and full of flavor, for an unforgettable finale to your most elegant meals. Serves 6-8. Extra thick, extra meaty center cut Boneless Pork Chops are a traditional favorite. Grilled, pan fried, baked or broiled these moist, meaty chops are perfect any way you fix them. A 4 oz. 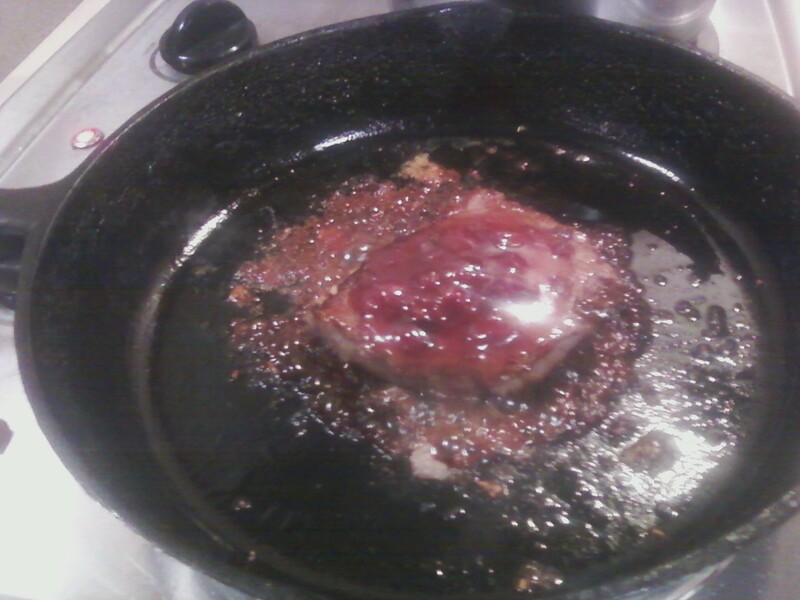 Boneless Pork Chop is approximately 1 inch thick. This is the PERFECT assortment for the busy family, as a care package for the University student (as my Lizz pointed out to me several times), for grand-parents, your Pastor or Priest, or anyone! This is a great holiday gift idea, of course. This is such a busy time fo the year, the holidays rush at us and this assortment is such a time-saver. Great food, great price, and so convenient! For us, it served to make the tastiest Sunday dinner with my Mom (which is a tradition for us). We took the pork chops, stuffed baked potatoes, and the oh-so-good Chocolate Lovers cake! Trust me, it was a HUGE hit! Everything was easy to assemble and prepare, the chops were incredibly juicy, the potatoes were perfect (and I generally don't like frozen potatoes) and not "mushy" at all. 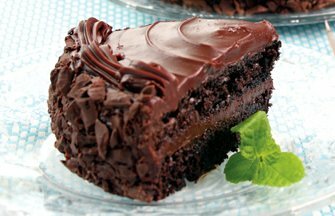 The Chocolate Lover's Cake is rich, creamy, moist... I want a slice right now so much it hurts. The steaks... the burgers... the chops... the deep, rich flavour is almost impossible to describe. This is the best of the best quality meats you will ever find. Mike and I were really amazed. We knew it was going to be very good, but we just didn't realize just HOW good. I do wish I had more photos of me cooking -- but we cooked -- we ate! You understand! LOL! I will not hesitate to purchase from Omaha Steaks in the future (Yes, Lizz, Christmas is coming!) and highly recommend them to my readers. You will not be disappointed. Facebook, YouTube, The Steakbytes Blog, and @OmahaSteaks on Twitter. 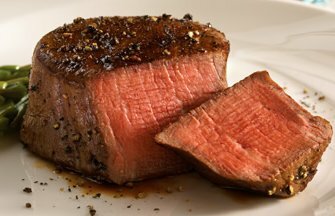 Omaha Steaks has generously offered one of my readers the chance to win a $50 Gift Card! WOO HOO! OPEN TO USA ONLY. Contest ends at 11:59 p.m. on 10/29/11. I received The Ideal Gift Assortment for the purpose of review. I received no monetary compensation. The opinions expressed herein are my own and based on my own use of and experience with the items. I'd like to try the Curried Lamb Chops. I would try the recipe for Tenderloin Tips in Pita Pockets with Yogurt-Tahini Dressing, yum! I would most like to buy one of the complete meals like, Italian Chicken Feast. Would like to try the Mini Flat Iron Steak Tacos. I'd like the Signature Sampler. I would like to try the Spicy Grilled Ribeye Steak recipe. I would like to get Omaha Steaks' The Gourmet Steak Sampler. I'd like to try the mini flat iron steak tacos. I'd like to buy the bacon wrapped filets. i want to try the garlic aged rib steaks. i want chicken breasts from here. The Flat Iron mini steaks. 5 cheese bread is awesome...I would buy that. I would like to try the bistro beef steak. I would get the 4 (6 oz.) top sirloin. Filet Mignons would be great to get. I love Omaha Steaks products. The Perfect Denver Omelet is a recipe Id like to try. The Classic Cookout Pack is what I want. I'd like to try the Calypso Burger recipe. I'd like to try the bacon-wrapped filets. I'd like to try the Breakfast-in-bed Steak and Eggs with Salsa Fresca recipe. I'd like to try the Bacon Wrapped Filet Sirloins. Those Private Reserve Angus Burgers look awesome! I love burgers. I would rather have a burger than a steak. The recipe for Private Reserve Garlic Herb Steak Butter sounds heavenly! 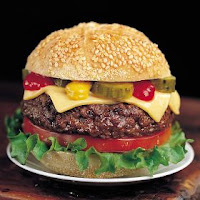 The All American Burger recipe looks great. I would like to try the The Gourmet Steak Sampler. I'd like to try the Perfect Denver Omelet. Most likely to buy the strip steaks. I'd like to try the Omaha Steaks Southwest-Style Turkey and Bacon Sandwich with Chipotle Mayonnaise! I'd like to order the 4 Lemon Lava Cakes! & 2 (18 oz.) T-Bone Steaks. The Steakhouse Crostini recipe looks yummy! I would like to try the honey glazed beef brisket recipe. I would like to buy the Elegant Anniversary combo pack. I would love to try the romantic dinner for 2 recipe. I'd like to buy the Savory pot roast dinner. I would like to try the Grilled Lime Flat Iron Steaks recipe. I would most like to buy the Boneless Heart of Prime Rib Roast. What a treat that would be! I've got a ham just calling for the Apricot Glaze for Ham recipe! I'd most love to buy the 8 (6 oz.) Hickory Marinated Salmon Fillets... and then move on to their delicious steaks! The Garlic Stuffed Ribeye Recipe sounds awesome. I would PROBABLY buy 4 8oz Ribeyes. The BBQ ranch chicken wraps sound good! I would like to try that recipe. I would like to buy sirloin or T-bone steaks. The Private Reserve Filet Mignons would be great. Would buy the Savory Pot Roadt Dinner. If I won I would love to get coconut shrimp and a dessert. I'd love to try the Grilled French Dip Burger with Brie Cheese recipe. I'd get the Surf and Turf and the Lobster Mac & Cheese. I would like to try the chicken-fried steak dinner recipe. I would most like to buy the chocolate molten lava cakes. i want to try the texas barbeque bacon burger!!! yummy. I'd try the chicken fried steak recipe! I'd buy the tenderloin tips. Grilled chicken and brie cheese sandwich. Love to try the Grilled Lamb Chops with Mint Jalapeno Jelly. But too scared to. I'd buy the Filet Mignon package of (6) 5 oz. filets, if I had the money. Love a great filet. I want to try the Sweet-Rub Ribeye Steaks. Yum. I'd buy pretty much any of their steaks. It's my favorite! Ginger Beef And Noodle Bowls recipe. I'd like to try the Omaha Steaks Top Sirloin Steaks and the 6 Chocolate Molten Lava Cakes...yum! I would love to try the Omaha Steaks Italian Breaded Veal Patty Bomber Sandwich recipe. I would like to get the 8 (4 oz.) Italian Breaded Veal Patties. The Filet Mignon Steak with Roasted Vegetable Salad looks good. I'd love to buy the Filet Mignons and the Potatoes Au Gratin. I would like to try Blackened Steaks recipe. I would like to try Creme Brulee and Beef Brisket! I would love to try the Roast Beef And Yorkshire Pudding With Roast Potatoes And Gravy! I would love to buy the Bacon-Wrapped Top Sirloins! The Southern Italian Steak and Pasta sounds so delicious!! I would love to buy the Chocolate Lover's Cake! The Mesquite Grilled Porterhouse Steaks recipe sounds delicious. I would love to purchase The Talk of the Town package. I really want to try BBQ Ranch Chicken Wraps. I love wraps. The Pan Seared Caesar Beef & Potato Salad sounds yummy! I'd like to try the honey mustard kabobs. I'd like to try the Ideal Gift collection sampler. . . but I'm really craving a ribeye right now! id love to try the chicken fried steak recipe! I would like to try the Mini Flat Iron Steak Tacos. oh prime rib sounds so yummy right now!! The Bacon Wrapped Tenderloin Tip Appetizer is calling my name! The Crab Benedict looks delicious! I'd like to try the Flatiron Steaks. I would love to try the Pesto Rubbed Tri Tip Roast recipe. I would love to buy the Beef Brisket Dinner. Love to try the Jimi Hendrix Steak Experience. I would like to try the flat iron steak tacos...yummy! I would love to try the "Ranchero" Beef Salad with Lime Chipotle Dressing. I would love to try the Gourmet Steak Sampler and the NY cheesecake. I'd like to try Mini Spinach & Artichoke Quesadillas.